Cheer on students in the Panathenaic Torch Relay Race! 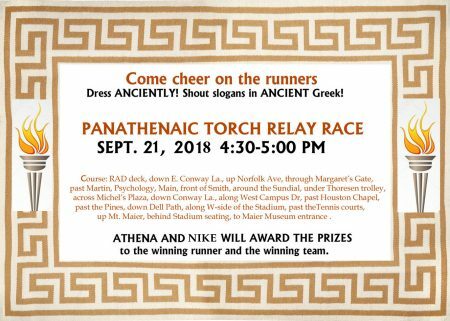 Classics students are gearing up for the second annual Panathenaic Torch Relay this Friday, September 21, at 4:30 p.m. The Randolph community is invited to come out and cheer on the contenders as they navigate the course through campus. The race begins on the RAD Center deck, winds through campus, and ends in the parking lot of the Maier Museum of Art at Randolph College. Following the race, Athena and Nike will award prizes to the winning runner and winning team.